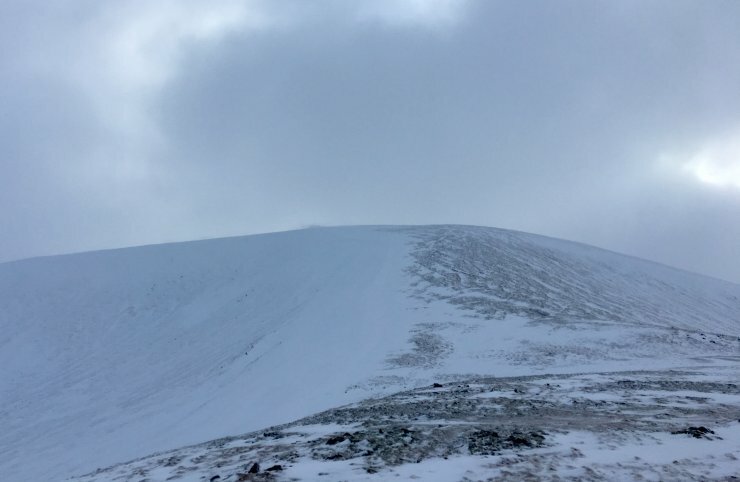 I could have done with wearing a heavier rucksack today or should have eaten more doughnuts before I went out….You know it’s seriously windy when you are trying to walk downhill and you are getting blown backwards UP hill. I had to dig a meter deep hole into the slope today just to get a break out of the wind for a while. Yesterday’s awful weather has taken it’s toll with the River Dee flowing wide and fast today – lots of snowmelt in the last period. However crampons were required today at an icy col at 900 metres just to make progress in the strong winds on the refrozen surface. There was some fresh snow overnight and the plume of spindrift being stripped out of the top of Coire Fionn, Glas Maol could be seen from the roadside down at Sean Spittal bridge on the A93. 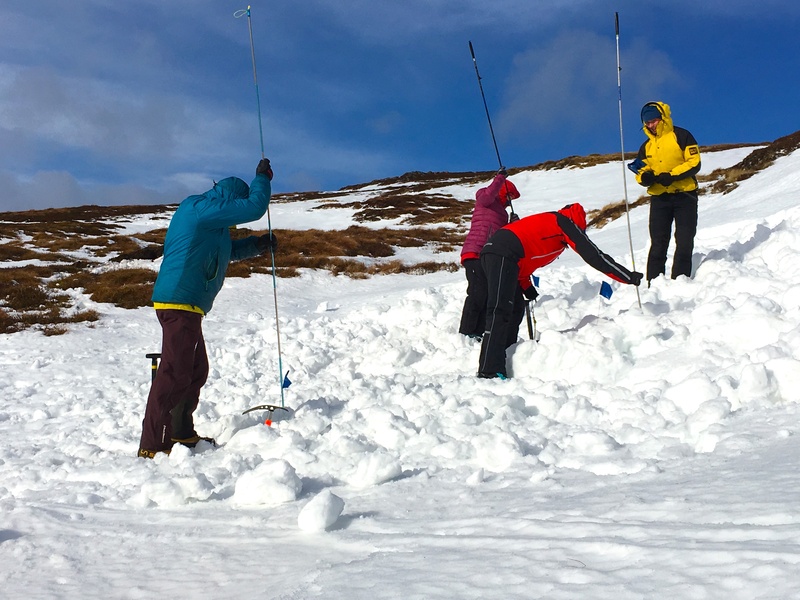 The snow was refreezing at higher elevations today developing a strong crust. This process will continue in the next 24 hours with the old wet snow becoming firm, icy and well bonded. Only a few locations will hold onto moderately bonded deposits. Runouts are poor at the moment with a lot of exposed boulders – so the simple trip or slip could have a very serious outcome. 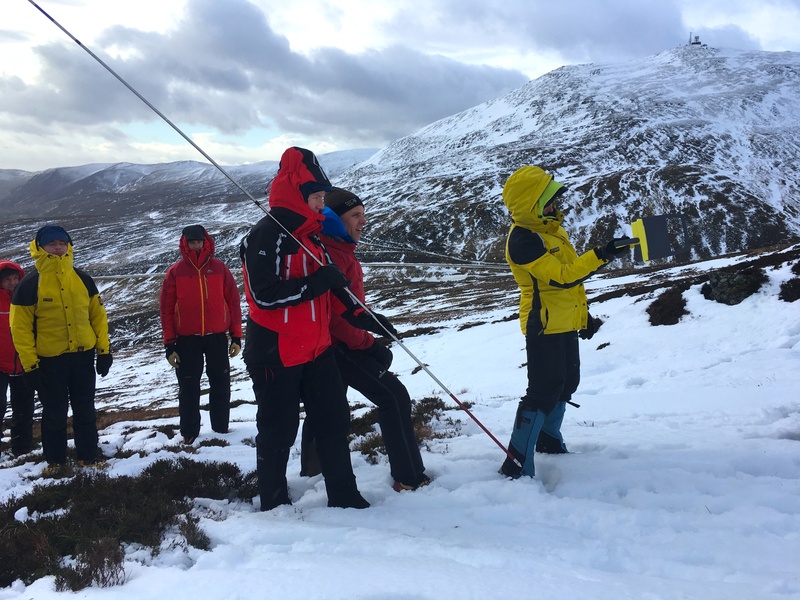 Strong wind indicator – Exposed slope stripped of snow with new deposits high up in the North facing Coire Fionn. A permanent plume of spindrift was being stripped out of the top of the corrie today – just visible in the middle of the picture. ‘Hot Spot’ probing: Location indicators of buried individuals such as personal items are marked with the blue flags and rapid probing around these areas are used in the early stages of a search for a buried person. 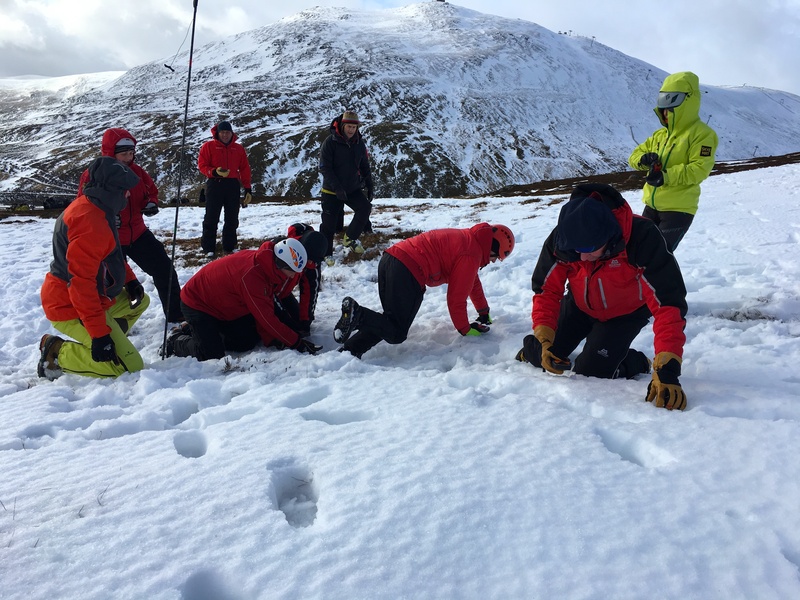 Scottish mountain rescue teams members training using a Recco rescue unit. Recco reflectors are sewn into garments and emit a signal that can be picked up by this hand held search unit. Lower slopes up to 850 metres have lost a lot of snow. Higher mountains such as Creag Leacach (987m) in the back ground are holding onto their cover. Un-PC comment of the day: How do you spot the Scotsmen? They are the ones down on their knees searching for the pound coin that got dropped. 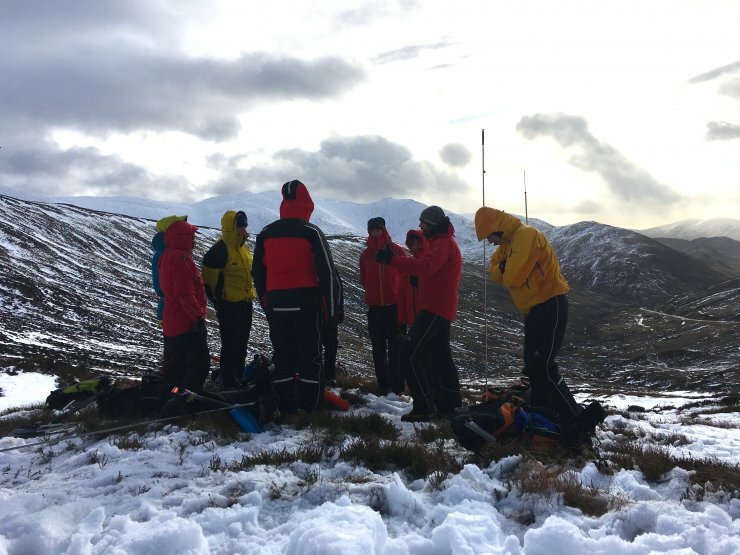 Seriously though – Avalanche transceiver training….